Three time world champion Giorgia Bronzini notched up her second win in three days and solidified her place at the top of the general classification in the Mitchelton Bay Cycling Classic today. The Wiggle Honda rider sprinted in well ahead of Annette Edmondson (Orica-AIS) and Tiffany Cromwell (Specialized Securitor) at the end of the third stage, which was held in Portarlington. Her final effort saw her finish well clear of the others, underlining her dominant form. “I am really, really happy because it is the first time that we meet for the season, and we work so well and it is a good feeling with the girls. I am really happy,” the Italian enthused. Her teammate Peta Mullens was once again aggressive, joining another Wiggle Honda rider Charlotte Becker, Valentina Scandolara (Orica-AIS) and Gracie Elvin (Jayco National Team) in the day’s main break. This ensured that the riders behind and their teams had to chase, including Cromwell. Becker rode until the first intermediate sprint, then dropped back. That left the other three out front. Taking both of those sprints ensured that she extended her lead in the Sprint Ace classification, ending the day with eleven points. This is five more than both Valentina Scandolra (Orica-AIS) and Lizzie Williams (Specialized Securitor). The break was eventually caught with four laps to go, after which Wiggle Honda marked the subsequent moves. Mullens then led out Bronzini into the finishing straight, enabling the Italian to blast home well ahead. “Today was a hard day, because of the wind, it was a really windy day and the short climb was tough,” she said afterwards. “But the team was so good in the whole race. Win number two puts her comfortably ahead in the general classification. 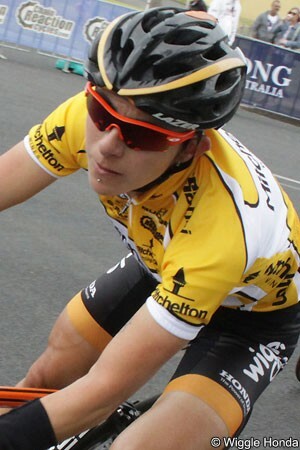 She now has 34 points, six more than Edmondson and eleven ahead of yesterday’s winner Chloe Hosking (Roxslot). Cromwell is fourth on 22 points, then Gracie Elvin (Jayco National Team) and Sophie Williamson (Vanderkitten) complete the top six. “We are really, really happy and proud,” said Bronzini. “Tomorrow we will look to keep my yellow jersey, and Peta’s green jersey, and we will look also to win the stage, maybe with someone else. The last stage will be held in Williamstown and, if things go to plan for Wiggle Honda, it will win the individual, sprint and team classifications.